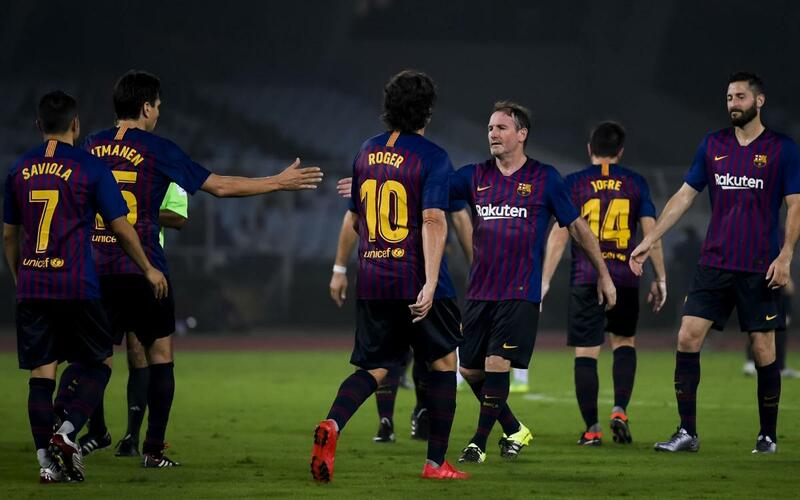 The Barça Legends have cruised to an emphatic 6-0 win against their fellow veterans of Mohun Bagan AC in Kolkata, with the goals coming courtesy of Javier Saviola, Roger García, Landi, Jofre Mateu and a brace from Jari Litmanen. Barça director Pau Vilanova was joined by the mayor of the capital of West Bengal, Sovan Chatterjee, to enjoy the game in the company of a huge crowd of 45,000 people. Despite the intensely humid conditions, the blaugrana veterans dominated the game from the outset. Saviola’s angled strike to open the scoring was just the start of it, with another of the first half highlights being Landi’s cheeky Panenka style penalty just before the break. It was one-way traffic for the rest of the game, and although six was a fine tally to bring home from India, there could easily have been more goals on top. The star of the second half was clearly Finnish legend Litmanen, but the assists from Saviola and Andoni Goikoetxea that led to them were also worthy of the occasion. The day ended with Juliano Belletti setting up Jofre to finish off a perfect day all round for the globetrotting team of former Barça players.